The titular proverb was incoherent because Morgan thought of it while he was Crazy Man. 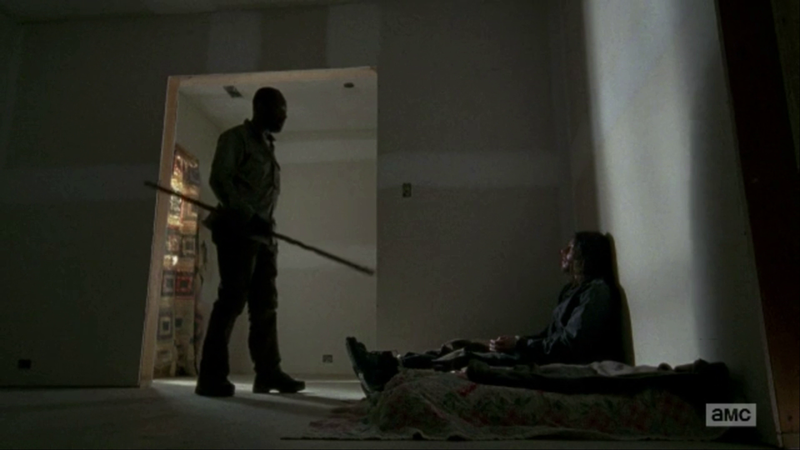 After Rick and his friends left with his guns, Morgan went into a straight-jacket-worthy hissy fit that resulted in the complete destruction of his former fortress. From that point forward he wanders the forest as a thoughtless killing machine, murdering everything in sight (friendly or hostile) and marking “CLEAR” on a rock when he’s finished with an area. 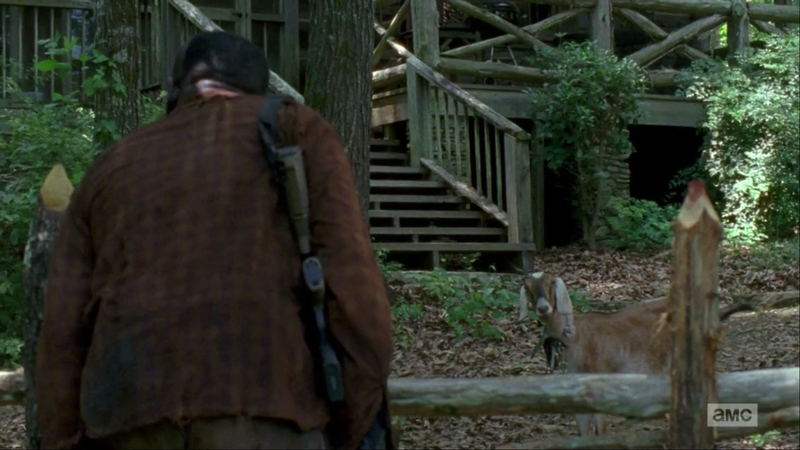 Eventually Morgan runs across…..a goat. While he’s mulling over in his head whether this counts as something to be “cleared” or not, he hears a voice warning him to put down his weapons. 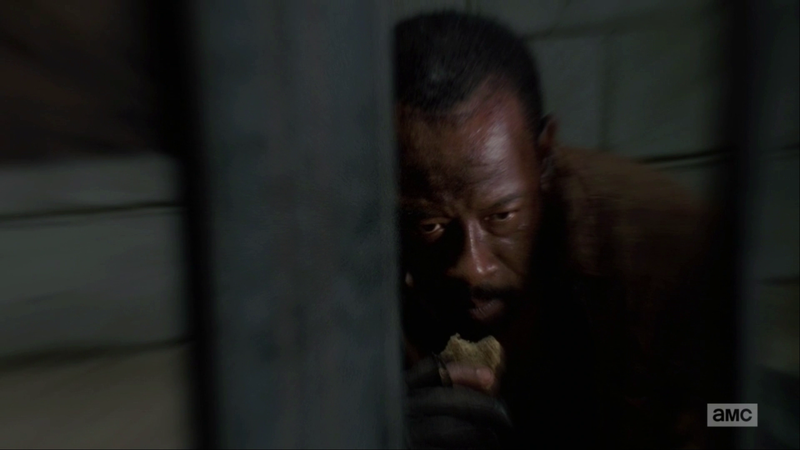 Morgan does the opposite and heads toward the voice, which belongs to a middle-aged man named Eastman. Morgan is prepared to do the same thing to Eastman that he’s done to who knows how many before him, but Eastman is quicker and knocks the dude out. When Morgan comes to, he finds himself inside the man’s woodsy cottage, trapped in an iron cage. I was prepared to point out how implausible it is that Eastman just has this professionally made jail, complete with bars, in a remote cabin in the middle of the woods. 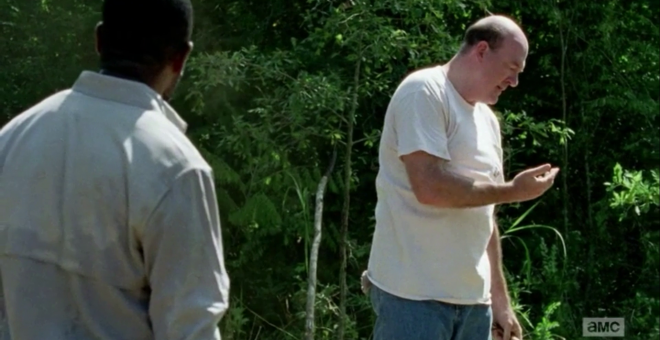 Other than holding Morgan, what other use would it have? Later on, though, Eastman DOES explain why the jail is there, and not only is there a perfect explanation, it’s one of the highlights of the episode. 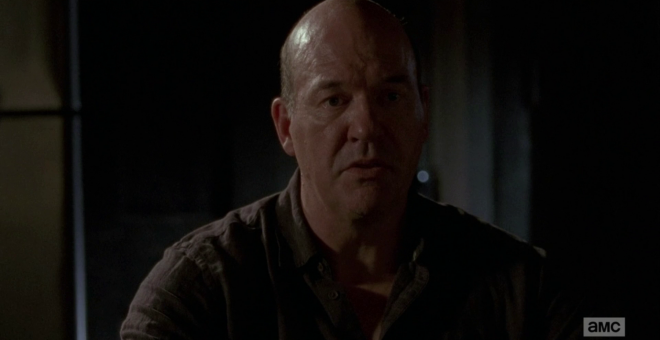 Eastman turns out to be a criminal psychologist, capable of delivering exactly the help Morgan needs right now. 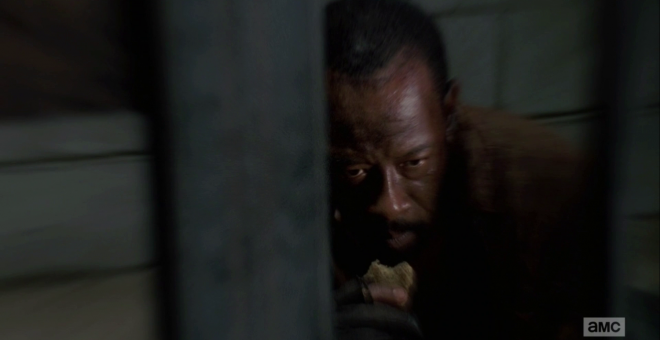 He keeps him in solitary confinement, feeding him vegetarian meals, denying Morgan’s request to “KILL MEEEEE!” and suggesting he read something called “The Art Of Peace.” After several days of this, Morgan attempts to escape by prying the wooden frame off the barred window, but before he can get very far, Eastman returns. 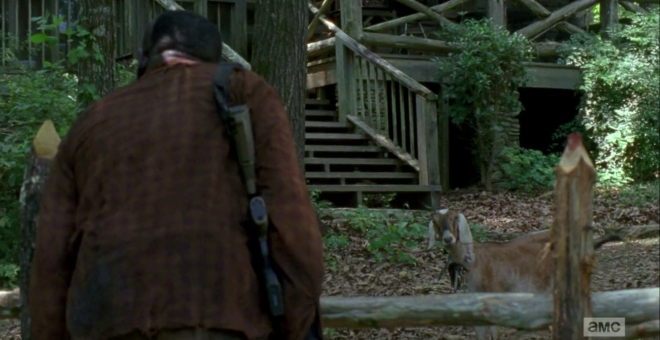 It doesn’t look like Morgan’s going to ever get out of here. You know someone’s telling a good story on TV if they need no extra visuals or flashback scenes to illustrate it. Eastman tells Morgan the origin of his prized plaster….as well as the one man he said was “evil,” and he needs nothing but his voice. The only man he couldn’t rehabilitate was named Crichton — an inmate who was deceptively charismatic and friendly on the outside but was a “true psychopath.” Eastman and Crichton got along well until Eastman diagnosed Crichton’s socipathy and recommended that he remained imprisoned for life. Eastman had now become a threat, an obstacle to Crichton’s goals, which brought out his true self. He turned on Eastman and attempted to take his life right then — but Eastman was able to fend off the attack and escape. So did Crichton, eventually. He busted out of prison for the purpose of finding and murdering Eastman’s family, and the moment he did so, he walked to the nearest police station and turned himself in. He didn’t take advantage of one other moment of freedom. He had escaped solely to torment Eastman and ruin his life. In response, Eastman quit his job and retreated to a hermit’s life in the woods, with the eventual goal of building a jail, grabbing Crichton, throwing him in there and watching him slowly starve to death. But while Eastman was away tending his crops and raising his goat, the zombie apocalypse hit. He had no idea until he went back into town to retrieve the plaster illustration Morgan just broke. He said he considered doubling back, but decided he had to brave the entire journey to get that drawing. Morgan is beginning to regain his sanity at this point. Eastman lets him stay in his cabin for a while. They both eat veggies and drink goat milk, and Eastman teaches Morgan Aikido, a non-destructive form of self-defense. It’s a real practice, and the polar opposite of Shaqido, an extremely lethal martial art form. 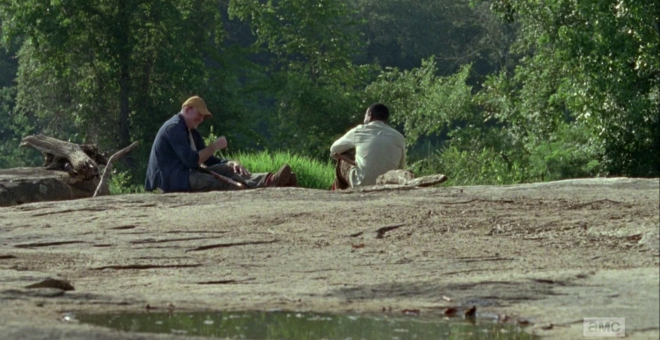 One afternoon Eastman and Morgan are training when a Walker approaches out of the woods. 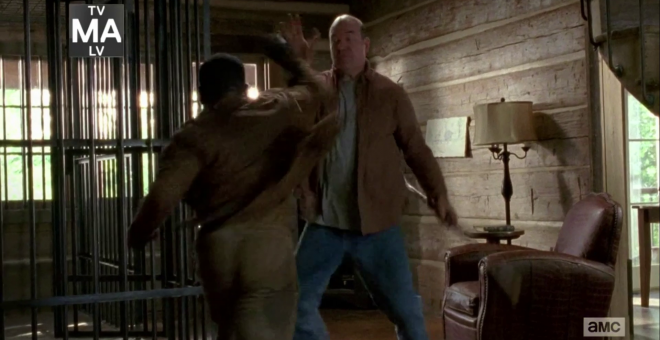 Morgan attempts to take him down with just the stick, but he’s still new at Aikido and has some trouble. That’s when Eastman steps in for him, and winds up getting bitten. 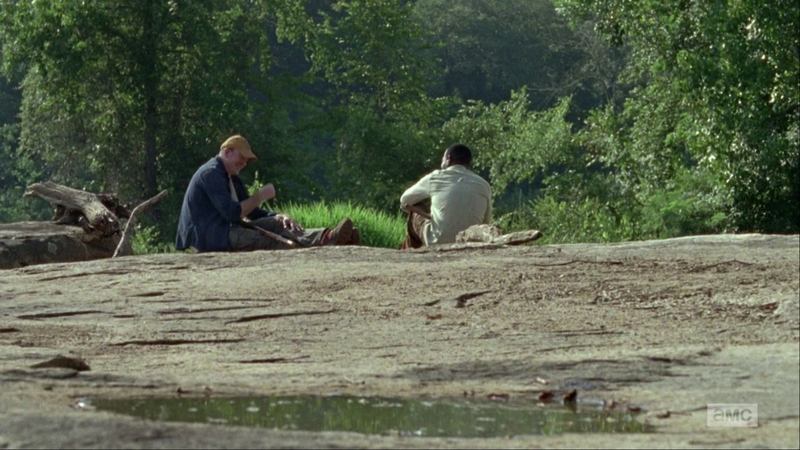 Morgan becomes so mad he nearly reverts to being crazy again, attacking two survivors in the woods. He manages to stop himself before he does too much damage. They leave a can of soup and a large piece of ammo to pacify him, and split. One time cut later, Morgan buries Eastman and sets off on his journey a changed man. 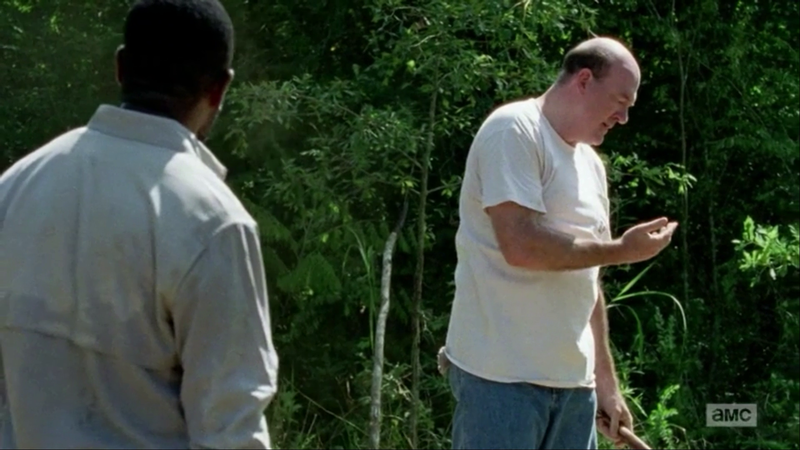 Finding the sign that directed people to Terminus (before it was vandalized), he decides to look for Rick’s posse, and we cut back to the present. 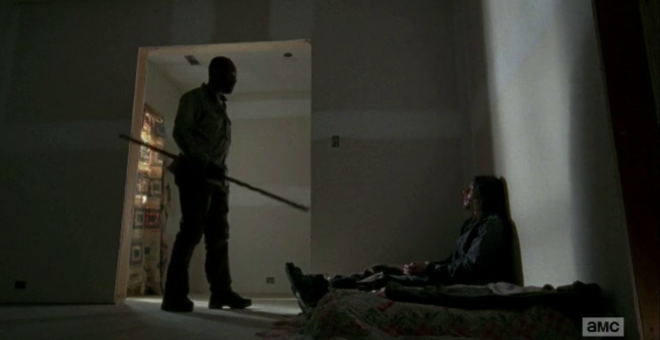 The entire episode is framed around Morgan telling this story to the member of the Wolves that he captured in episode 2. 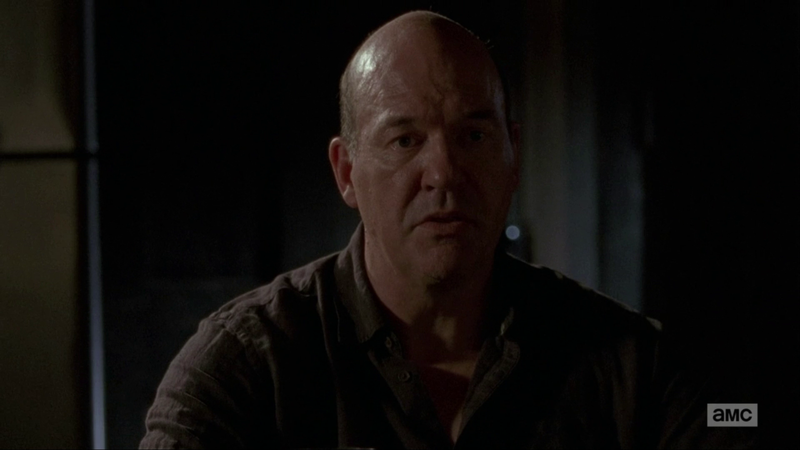 Morgan intended to imprint a lesson on this guy, the same lesson he learned, but it doesn’t stick and the man reiterates his intent to kill everyone. 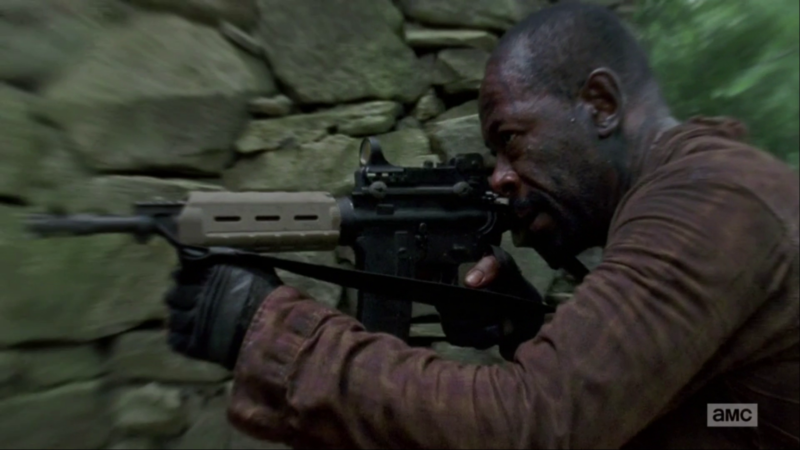 What will Morgan do now, if not kill HIM? He’ll lock the dude in the basement, that’s what. Let someone else sort this out.